The BFGoodrich g-Force T/A KD tire has the distinction as being the number one cornering tire among full tread street legal tires today. (1.08g in a recent test) With a silica tread compound and asymmetric design, this is one serious high performance tire on dry pavement. Unique g-Control inserts inside the sidewalls of the tire help it to generate its tremendous cornering abilities. But it also has some decent wet weather traction as well. Evacuation channels in the tread help eliminate the risk of hydroplaning. Keep in mind that Goodrich has designed this tire for summer driving only. It should never be driven in winter weather conditions. 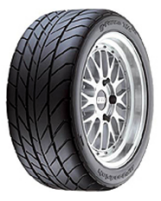 The BFGoodrich g-Force T/A KD ranges in price from approximately $120 for a 15″ series, to more than $300 for 18″ series. Who Is The BF Goodrich g-Force T/A KD Tires Designed For? BF Goodrich has designed the KD T/A tire for drivers of sports cars and sedans who are looking for extreme performance in a summer driving tire. These tires can be used on both the street and the track. BF Goodrich does not provide a treadlife warranty on the g-Force T/A KD tire. However, you will get a one-year or first 2/32″ wear on uniformity. There is also a 6-year guarantee on materials and workmanship. Free first year replacement or 2/32″ wear, and then prorated for the remaining period.